Rowman & Littlefield Publishers, 9780742522459, 192pp. Also available in the Spanish version. Bioterrorism has quickly become one of the most pressing and disturbing issues of our time. Our nation's leaders warn that the threat of germ weapons by terrorists is real, and, more importantly, that the United States remains highly vulnerable. Such statements have led to a national sense of fear and unease. Every American wants answers--what can we do to protect our families and loved ones? Enter Senator Bill Frist, M.D. At this crucial time, Senator Frist wants to provide all Americans with an accessible and comprehensive guide to dealing with the realistic threat of bioterrorism. Written in an easy-to-use question and answer format, complete with photographs of the varying symptoms and a full index, When Every Moment Counts is an essential manual for every American. 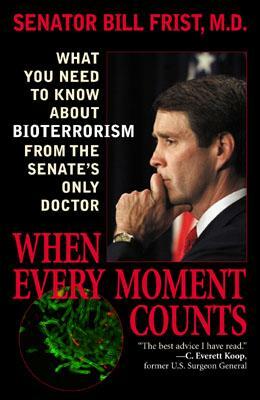 For more information visit Senator Frist's Web site for this book, www.wheneverymomentcounts.com. First elected to the U.S. Senate in 1994, Senator William Frist, M.D. (R-TN) is the first practicing physician to become a senator since 1928. In addition to performing over 150 heart and lung transplant procedures, Dr. Frist has written more than 100 articles, chapters, and abstracts on medical research as well as several books. Frist is ranking member of the Subcommittee on Public Health and Safety, serves in the Senate leadership, and was named one of two Congressional representatives to the United Nations General Assembly. Senator Frist and his wife, Karyn, have three sons.